Indiana Gov. 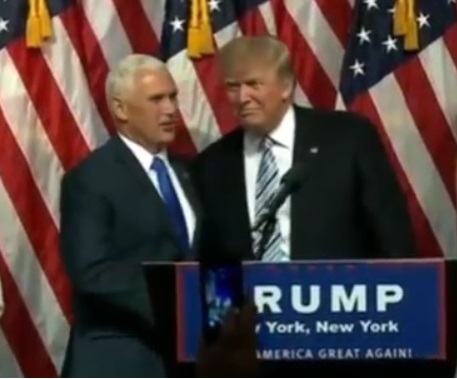 Mike Pence and Donald Trump at the announcement of the ticket. From Trump live stream of event. Trump made the announcement Saturday morning in New York. Pence, 57, is known as a social conservative and devout Christian. He took office as governor in 2012, and Trump’s announcement by Twitter on Friday came just an hour before the deadline for Pence to withdraw his candidacy for re-election in Indiana. Pence initially endeared himself to the right by pushing a “religious freedom” law, although he came under fire from human rights groups, the LGBT community and businesses who said the measure opened the door to widespread discrimination. A “fix” he later signed angered some evangelicals as a flip-flop. Pence also came under fire from the media for his plans to create a government funded “news” service to supply his own spin on state action to independent news outlets. But Maryland’s Republican convention delegates see Pence as providing some needed balance to the brash, unconventional Trump. Kennedy, who originally supported Ted Cruz, said the memory of Trump’s consorting with New York Democrats is still too fresh. “Many of my fellow Cruz campaigners are still somewhat wary of him. So Trump needed to burnish his conservative credentials,” he said. Corrogan Vaughn, a Trump delegate and congressional candidate from Baltimore, praised all of Trump’s short list candidates, which included New Jersey Gov. Chris Christie, former House Speaker Newt Gingrich, U.S. Sen. Jeff Sessions of Alabama and retired Lt. Gen. Michael T. Flynn. Maryland Trump campaign founder Sue Ghosh Stricklett said she previously worked with Pence. She said the running mate knows how to bring people together. “Those (poll) numbers very likely to go up,” Ghosh Stricklett said, now that Trump has picked Pence. Pence’s views may differ from Trump’s on certain issues, she said, but the governor supports the presumptive nominee on the core issues. John Stricklett, from the 8th congressional district, said Pence does not currently disagree with Trump. Michael J. Collins, a Republican delegate from Reisterstown, said he had heard of Pence, but was not familiar with the governor’s policies. Trump has become known for his bold statements and extreme positions – such as building a wall along the U.S. southern border to control immigration – and for belittling opponents. That history has rattled at least one Maryland delegate from the other party, who sees Pence as reinforcing the isolationist and bombastic side of Trump. Pence is “one of the scariest choices,” said Courtney Watson, a Hillary Clinton delegate to the Democratic convention from Ellicott City. She said she’s especially worried about his beliefs on immigration, LGBT rights and women’s reproductive rights.